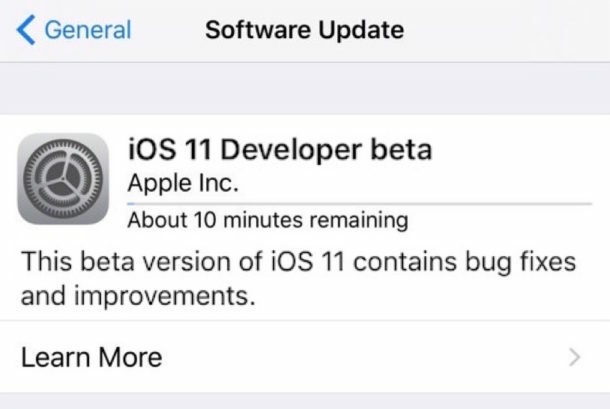 Yes technically, assuming you can get your hands on a legitimate iOS 11 beta configuration profile, or if you register for the Apple Developer program, then the iOS 11 beta can be installed on a supported iPhone or iPad immediately. I installed iOS 11 beta but I regret it, now what? If you installed the iOS 11 beta and now wish you hadn’t, the best thing you can do is downgrade from iOS 11 beta back to iOS 10. This requires restoring the iPhone or iPad from a backup, or restoring the device as new. Install iOS 10 Beta Right Now is Easy, But Should You? I have a developer account and was considering installing it…. after reading the above information I will decide and wait a while. When do you think a good time frame would be to install it, when the beta opens up for everyone else and not just developers? I’ve been using iOS 11 dev beta since the very first day! I have not found any serious issues so far. A little slow, sometimes unresponsive here and there but nothing too serious. I’m using it on my daily driver BTW. One thing I noticed though- it’s some apps with location services on sometimes get invoked automatically for no reason. For example, while driving using Apple Maps, my mile tracker app MileQ, Uber, Waze and some other apps automatically get launched though they should work in the background. It’s a definitely a bug but you should pay small price for the shiny iOS 11! It does say it’s verified. And someone here claims to have used it. Go for it! Believe me (at least on the iPhone 7 Plus) it is running much, but MUCH BETTER than the 10!!! I would never install a beta on my iPhone 7 as I live off that thing. But I did install iOS 11 on my iPad Pro. Its been surprisingly stable. I did have a locked screen once I had to restart after… but otherwise, so far, so good. I installed it on my iPhone 6 on Monday, and I haven’t regretted it too much. If anything, the only issues for me come when I’m going into and out of apps. Otherwise, it’s been rock solid for the 1st developer beta. I also installed it on my iPad Mini 4, and it’s been next to perfect on there. Performance is next to perfect, and the only bugs I’m seeing are the date and time on the lock screen failing to rotate (the top indicators rotate just fine though) as well as some occasional rotation issues on the home screen. Same can be said in regards to performance with the High Sierra beta on my early 2015 MacBook Pro 13 inch. I see the link goes to the beta user profile. Afaik, once you have that profile every beta update available will show up in settings>general>software update, just like the final versions do for the rest of us. I too have installed the dev version on my iphone 6 plus. I have to say some things respons better than ios 10 (like the app switcher which is very smooth now). I haven’t found any major bugs at the moment and every app I use seem to work fine, however the system overall is a bit slow. Control centre is a bit slow (especially the first time) and some things are removed on which I pretty much rely (for example, quickreply when your phone is locked, this is no longer possible). Also the new notification center is extremely slow on an iphone 6 plus (the part where you can scroll down to older notifications). Overall, I would never recommend people to use beta’s. I myself use it on my daily driver, but that is because I genuinely want to help Apple and I can work around bugs if I have to. I have to say though, this is probably the most stable major (EG. iOS 9, 10, 11) ios beta that I have ever run. iOS11 beta is pretty smooth on the iPhone7+ with a slight decrease on battery life. The App Store new look is quite impressive. hi ive downloaded the beta on my 7 plus but its taken 3 hours to just turn on and every 30 minutes or so the lock screen comes on but for the majority the screen displays the loading circle. i can’t press any buttons when the screen does come on, what should i do? Beta software is unstable and problematic. That is why it is recommended to NOT install betas. You can downgrade the iOS 11 beta back to iOS 10, assuming you made a backup beforehand you won’t lose anything. If you don’t have an iOS 10 backup you might lose the data on the device however if a restore is required. You will need to connect the iPhone to iTunes to fix it. Same problem on iPhone 7! downloaded beta profile > software update > download and install > endless loop for last 2 hrs – asking for PIN (on a very non responsive screen) then goes to dark screen with rotating wheel.. How did others get it working? Is it safe to use anyone elses beta software profile on our iPhone?